Comprised of antique factory buildings turned to studios, the River Arts District is a prime example of Asheville’s creative bend. Artwork that spans multiple genres, hands-on workshops, and exceptional dining are only the beginning of what you’ll find! 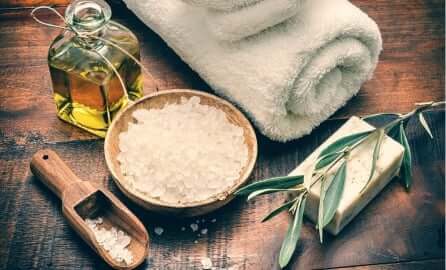 Read on to discover 10 of the best ways to spend a day in this creative district, and if you are looking for more ways to delve into the arts, consider our Cork N Brush Package at The Esmeralda Inn & Restaurant! This package features a guided painting class, gourmet dinner, wine, and more. If you don’t have a hands-on experience during your visit to the River Arts District, then you are missing out. Glassblowing is a fascinating artistic display, and the North Carolina Glass Center is the best place to experience it. Watch an in-house artist create a masterpiece, and remember to try your hand at glassblowing with one of their classes. After trying your hand at glassblowing, head over to the Mark Bettis studio to delve into fine art. Bettis uses a variety of mediums in his paintings, including cold wax and oil paint. His work is both tasteful and inviting. Here, you will find modern works, animal portraits, and more. When you stop by his space in the Wedge Studios, you will also see works from fellow artists Jacqui Fehl, Constance Williams, and Grant Penny. Oil and cold wax classes are available! The River Arts District is full of amazing artist studios, but if you are unsure of where to start, we recommend Kristin Foley’s. Her contribution to the River Arts District is phenomenal! Here, you will find unique pottery and clay creations, publication design work, and beautifully detailed paintings of flowers and the human figure. If you are looking for a new piece of furniture or decor to brighten your home, then make your way over to Silver River. The chairs and furniture here are crafted with rustic appeal through an old process known as “chair caning”. They offer a variety of workshops, repair services, and a museum dedicated to the history of four-legged furniture. A fine piece of jewelry has the ability to completely transform an outfit, and the work at Monty’s Follies is no exception to this rule. Comprised of three-dimensional metal shapes, including copper, fine silver, and gold, the jewelry here is extraordinary! If you are searching for one-of-a-kind, floral-inspired pieces of jewelry, this jewelry studio is the place to go. Handmade clothing possesses an appeal that factory-made goods can’t capture. Make a trip to Cara May and you’ll understand why. Here, you will find an assortment of tasteful items, including cardigans, tunics, and tanks tops. Each piece is handcrafted with natural materials. This is the perfect place to update or add something special to your current wardrobe. Find her studio in the Riverview Station building. If you visit Asheville any time between the beginning of May and November, then you’re in for a treat. The River Arts District Farmers Market runs on Wednesdays from 3:00 p.m. to 6:00 p.m. every week, rain or shine. You will find dozens of local farms, creameries, and bakeries here. From Sweetheart Bakery to Spinning Spider Creamery to Dry Ridge Farm and beyond, the River Arts District Farmers Market is where you’ll find Western North Carolina’s most celebrated local foods and products. The graffiti, murals, and paintings that you will find in the River Arts District are a testament of the city’s deep appreciation for art, culture, and history. One of the best places to go for brilliant street artwork is the Foundation Walls. This project began in 2016 and is a place where graffiti artists paint the walls of the old warehouses at 339 Old Lyman Street. These huge canvases showcase ever-changing designs and spread across over 13 acres. After a day of exploring Asheville’s amazing artwork, there isn’t a more refreshing way to end the day than with a cold beer at Wedge Brewing Company. Craft beer is an art that Wedge has perfected. Whether you are craving an extra hoppy IPA or a robust and chocolatey stout, this River Arts District brewery that has it all. Guests can enjoy live music every Saturday at Wedge Studios. 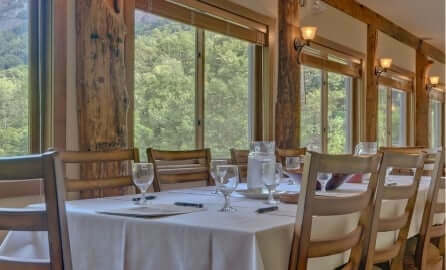 After a day of fun in Asheville’s River Arts District, head home to The Esmeralda Inn & Restaurant for a night of relaxation. 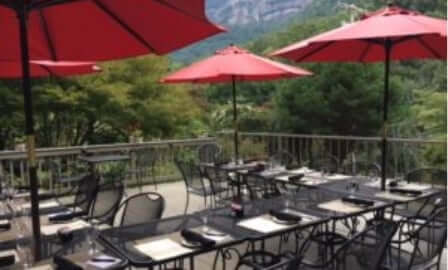 Nestled in one of the most incredible canyons, our inn features a unique blend of Western North Carolina’s beautiful mountainside and proximity to the bustling city of Asheville. The Rocky Broad River Cabin is a beautiful accommodation with stunning views of the Rocky Broad River. 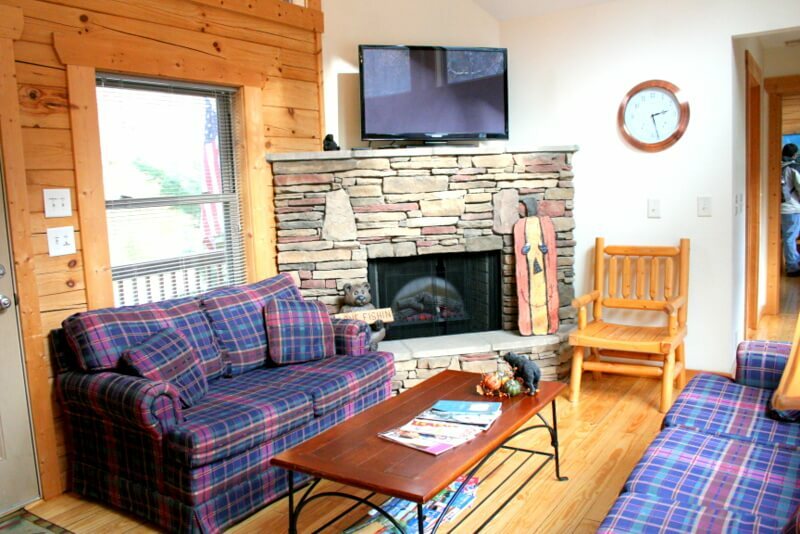 This cabin features luxury linens, a full kitchen, two full baths, and more. Complimentary breakfast, access to our outdoor hot tub, and spa services are a few amenities that our guests enjoy. 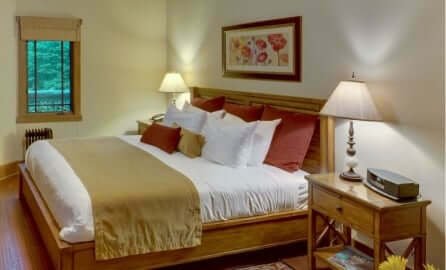 When you are ready to plan your vacation, check our current specials and book your stay! If you are looking for more fun ways to dive into the arts during your Western North Carolina vacation, download our free Chimney Rock/Lake Lure Vacation Guide.